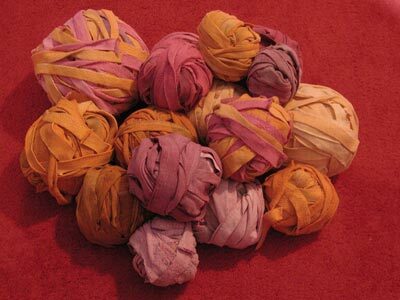 All those dyed shirts, cut into strips. The 2-color ones were made from sweatshirt rags, dyed separately & then stitched into big loops. The darker balls all started gray. I’m carrying a strand of wine-colored Schulana Morbido (80% wool/20% nylon, sorta lofty thick/thin) along the whole way. I’m trying to decide what stitch to use. The Alterknits version just uses garter. I experimented with plain garter, this moderately pleasing thermaly stitch that probably has an actual name (K1 row, P 1 row, *K1, Sl1 wyib 1 row, *K1 Sl1 wyif 1 row), and the K1 Sl1 wyif every row pattern used in that woven strips rug in Simple Knits with a Tiwst . I tried them all for about a ball’s worth, then ripped them out, not able to decide. I think the last one was the best suited, but just as I was feeling well pleased with it, I decided I wanted a big fat cable down the center and ripped it all out. Then I decided that would be stupid with such busy fibers, but it was too late. Story of my life. Pingback: T H E . T H R I F T Y . K N I T T E R » Blog Archive » Alterknits rug. Ugh. Yes, you start at the bottom hem and cut around and around. The Alterknits pattern has you stop at the armpits, which gives a nicer, more uniform appearance, but I was using scrap/rag shirts & both Ts & sweats, so I didn’t care about the irregular appearance. I kept going as far as I could into the sleeves, then sewed the sleeves shut, trimmed the bottom, and started over/continued (depending on the shirt) like it was the bottom of the tshirt. If you have plenty of shirts, I’d probably do it their way, because it is cleaner looking. Hi. After finishing a project using recycled t-shirt yarn, I set out to find others who had done the same. I think we are on to something. There are too many t-shirts in the world not to make use of them for other purposes. I like your colors, too, but agree it would be too intense of a rug in my home.